Sitting on a ledge in front of Ayelew Desale's grocery store behind Tel Aviv's central bus station, Selemon Tesfy inhaled the last bits of his cigarette and recalled his flight from Eritrea to avoid a lifetime of servitude. He was kidnapped in Sudan, sold to Sinai Bedouins and freed only after his family gathered its savings, borrowed money, went begging and paid $30,000 to secure his release. One aid organization, Kav La'Oved, said that since that law passed, about 300 people reported moving to jobs where they were paid in cash, cut expenses on food and medicine, or were working longer hours. Assaf, another aid organization, said that more than 1,300 people have requested food, and live in fear of losing their jobs. Many of them refrain from reporting health and mental problems. Bisrat Gebryesus, Director of the Eritrean Women's Center in Israel, says prostitution is on the rise. Most mothers are single parents who need money for food and school expenses. Gebryesus said a woman in this situation sometimes has "no choice but to sell her body." But what is obvious is that people are moving to more crowded homes. Beni Shasha, a real estate agent, said it is common to see crowded, suffocating, dirty apartments with four, five or six people sleeping in a room. 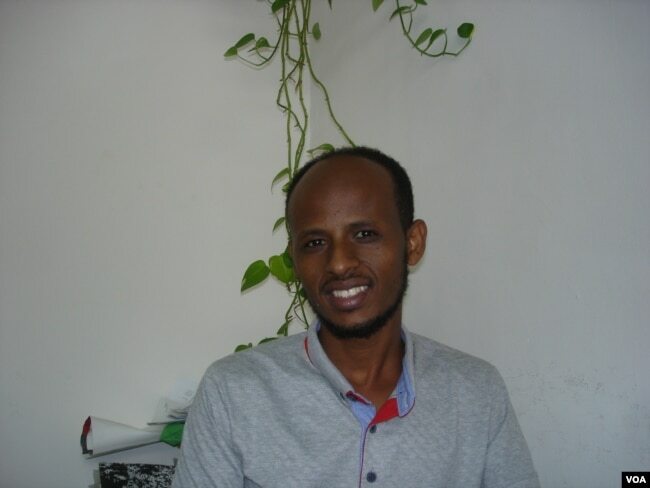 Gebreyohna cleans offices and translates at Assaf, a refugee aid organization. He used to film community events and edit them, but not anymore. In his current apartment there is no room for his computer. "I can't make any noise," he said. The law aims to get illegal migrants to leave. Israeli officialdom calls them "infiltrators." Almost all of them are from Eritrea and Sudan. Sending them home would violate international norms that prohibit repatriation to countries where they might be exposed to torture, cruel, inhuman and degrading punishment. Except for rare exceptions there is no other country willing to host them. Israel then signed an agreement with the United Nations High Commissioner for Refugees whereby the U.N. would relocate half the migrants and Israel would issue visas to the other half. 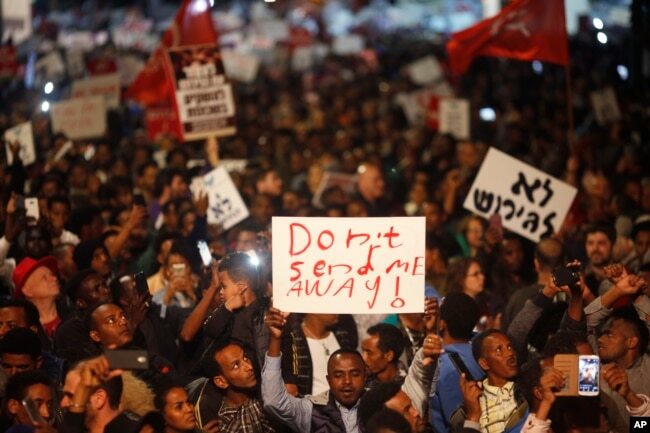 The migrants are prominent in some low-income Tel Aviv neighborhoods and their Israeli neighbors, who say they are living in fear, protested vehemently. Right-wing politicians joined the critics and Prime Minister Benjamin Netanyahu canceled the agreement. The 35,000 so-called infiltrators hardly scratch the overall demography of Israel and its population of almost 9 million. But the government is concerned that infiltrators would flood Israel if it hints readiness to accept them. "Israel will cease having a Jewish character," said Dr. Amnon Kartin of Tel Aviv University who specializes in geography and state policies. The government has, nevertheless, been lax in enforcing the law. The manager of a branch of the Israeli Aroma Espresso Bar chain in the central Israeli city of Modi'in was surprised to hear such a law existed. He showed a reporter the pay slip of an African employee that showed the only deductions were for income tax and payments to the Israeli national insurance system. In Tel Aviv, Mula Avraham, an Eritrean who handles stock in a grocery store, said uneducated migrants succumbed to the law but others who can read and follow developments persuaded employers not to cut their pay. "The [deducted] money would be lost. Really lost," he said. Many workers switch jobs and "where will you find that money? What lawyer will search for it?" The President of the Supreme Court Justice Esther Hayut ordered the government to report by October 7 what it is doing to enforce compliance. One of the justices, Isaac Amit, put it bluntly. The government's action, Amit said, "is [designed] to make the workers' lives miserable."